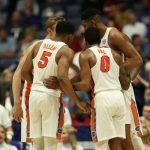 Florida Gators basketball improved to 3-0 on Thursday but not without some stress as Florida squeezed out a 73-66 win over the St. Bonaventure Bonnies at The Lakeland Center in Lakeland, Florida. 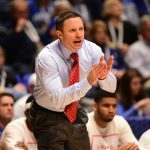 OnlyGators.com breaks down Thursday’s win below. It was over when … Tied at 66 with over 90 seconds left in the game, Florida’s hustle and defense locked down St. Bonaventure over the remainder of the contest. The Gators hustled for rebounds and two fastbreak dunks, forced two turnovers and made 3-of-4 free throws over the final 56 seconds to win by seven as the Bonnies were forced into bad shots and difficult ball-handling situations. 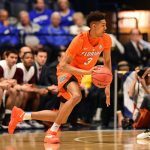 Exceptional efforts: It was a rough night for Florida, partly because junior forward Devin Robinson was underutilized in the game. Robinson went 6-for-6 from the field with 14 points and grabbed seven rebounds on the evening, though he saw the fifth-most minutes of anyone on the court for UF. Sophomore guard KeVaughn Allen got off to a rough start but made 2-of-3 threes with a team-high 16 points, a total matched by graduate transfer Canyon Barry, who made 3-of-7 triples and 5-of-6 free throws. Significant stat: Florida apparently had no interest in making the simplest shots on the court Thursday. The Gators went 23-for-56 from the field (.411) and reverted at the charity stripe, hitting just 65.5 percent of their free throws (19-for-29 in the game, 8-for-16 in the second half alone!). For some reason, UF did not have the same issues from beyond the arc, draining 8-of-17 shots from downtown. Those 24 points played a major role in Florida staying in this game despite it getting 15 more free throw attempts than St. Bonaventure. UF was hitting 78.9 percent of its free throws entering Thursday. What it means: The Gators survived a test, though not an unexpected one as the Bonnies are a quality team. Florida gave up a 15-point lead in the second half, which is unacceptable, but showed it can close out a game with a 7-0 scoring stretch and two turnovers to end the contest. That’s important for a young team that is still growing and developing. No doubt head coach Mike White will use this tape going forward. Up next: Florida will continue its barnstorming tour of the state when it hosts Belmont on Monday in Tampa. The game will air live nationally on SEC Network as the Gators begin a run of four-straight televised games spanning the rest of November.